Logan Circle Luxury Apartments in Washington, D.C. The Logan Circle neighborhood is an eight-block area surrounding the tree-lined traffic circle at the center of the neighborhood. The historic neighborhood is comprised of late 19th-century residences designed predominantly in the Late Victorian and Richardsonian Romanesque styles of architecture. It features many restored architectural wonders, with new shops and restaurants popping up every day. A short walk in any direction leads to virtually all major city activities. 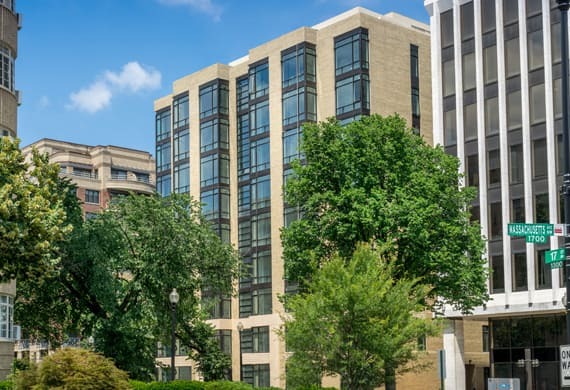 Keener Management is currently leasing apartment homes in three Logan Circle luxury apartment complexes: The Gatsby, M Street Towers, and Sutton Plaza. Constructed in 2002, The Gatsby is modern art deco at its finest. Quality maple hardwood flooring, designer lighting, stainless steel appliances, granite countertops, and stately 7-foot windows create a warm and inviting living space. The Gatsby’s rooftop lounge area provides a lovely outdoor retreat for residents. One- and two-bedroom units available. The M Street Towers celebrates the clean lines and minimalism of modern design. Residents enjoy newly-renovated apartment units featuring hardwood floors, stainless steel appliances, recessed lighting, washer/dryer in each unit, and more. Fine restaurants, shops, and cultural attractions are all within walking distance, as are all Metro lines. Studios available for under $2,000. With a distinctly retro feel, Sutton Plaza features newly-renovated units with large windows, ample closet space, hardwood floors, and modern kitchens with stainless steel appliances, recessed lighting, and sleek countertops. Sutton Plaza offers unparalleled comfort and convenience in the heart of the nation’s capital. Studio and one-bedroom units available. We welcome your inquiries about our luxury apartments in Logan Circle. Browse images of The Gatsby, M Street Towers and Sutton Plaza on our website, and call or email our professional staff members to schedule a viewing. Learn more below about life in the historic Logan Circle community. Situated between the Dupont and Shaw neighborhoods, Logan Circle is the only Washington, D.C.-based circle to remain entirely residential. A barracks town during the Civil War, later converted to a refugee camp for newly-freed slaves after the war, the neighborhood was transformed again in the early 20th century into a popular shopping center. It was also host to one of the very first auto showroom locations in the early days of the automobile. Today, the exclusive neighborhood is within short walking distance of several museums and important landmarks, including the National Geographic Museum, the Walter E. Washington Convention Center, the Boy Scout Memorial, and the African American Civil War Museum. From the soul food offerings at Georgia Brown’s on 15th St. to the rustic Italian menu at Tortino Restaurant on 11th, Logan Circle has an abundance of restaurants, cafes, and eateries offering cuisines from across the globe. Choose from classic American fare, modern French cuisine, gourmet burgers, and more, all within walking distance in this tight-knit community.